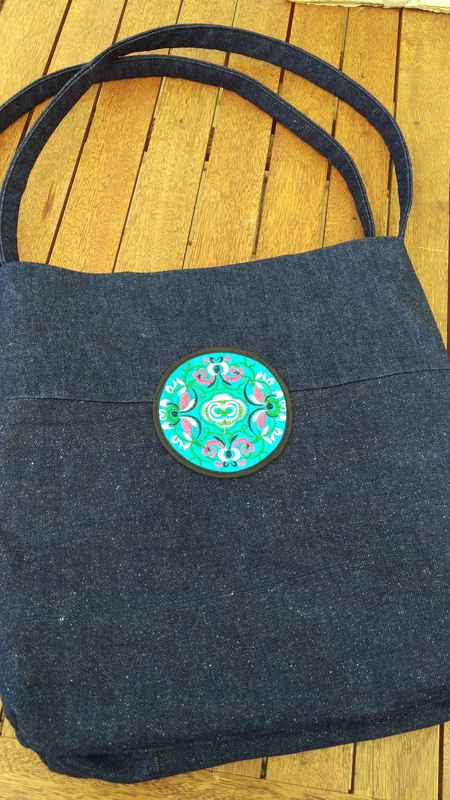 I am still in love with this traditional Japanese style of bag. Having acquired Japanese fabric scraps in Japan, I made some more, combining recycled clothing (a red linen shirt from the op shop and a maroon sleeveless linen shirt worn very much by me since the 1990s became linings) with fabric I have dyed with indigo as well as all kinds of Japanese fabric scraps. I find this design very cunning, and in Japan, I was struck by the different styles that casings tended to take, with drawstrings travelling through casings that were quite separate from the main bag. In the drawstring constructions I more often have encountered and created, the drawstring passes through a casing in the garment or bag itself. And there it is again. I constantly find myself creating series, and I constantly find myself much more readily making scraps, remnants and recycled fabrics into projects rather than using untouched loveliness in my possession, as if it is too special and valuable to cut, even when it is a gift! I’ll have to work on that, because of course I want people to use the things I gift them! 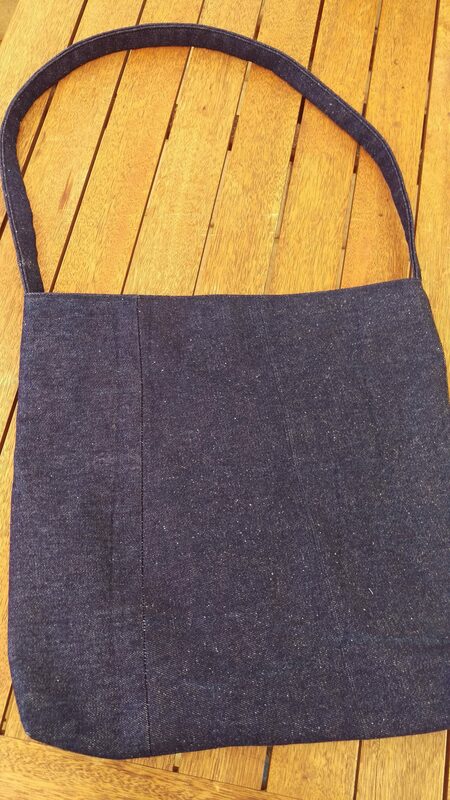 As people who read this blog regularly already know, I make a lot of bags, and I almost always give them away. 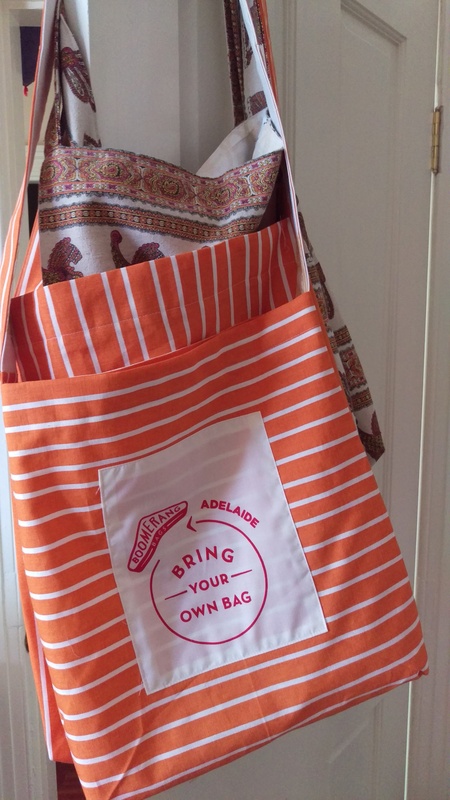 So when Boomerang Bags started up in Adelaide (and it wasn’t started by me–woot!) 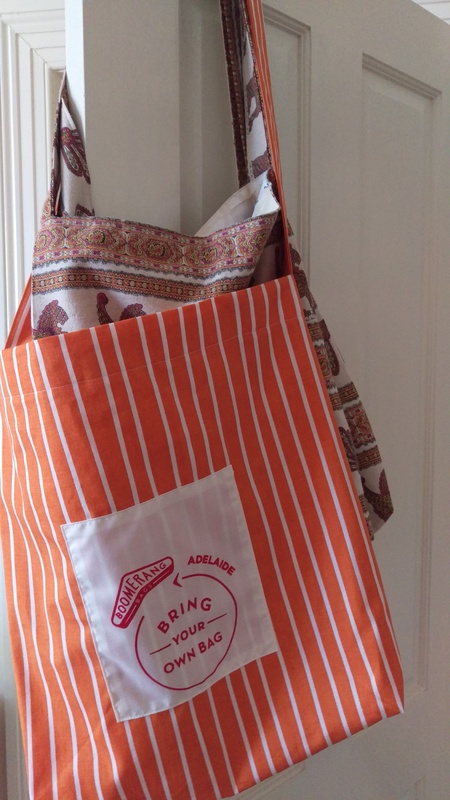 it seemed entirely logical to join their end single use plastics interventions by making bags for them. I made an initial 6 and gave 5 away. 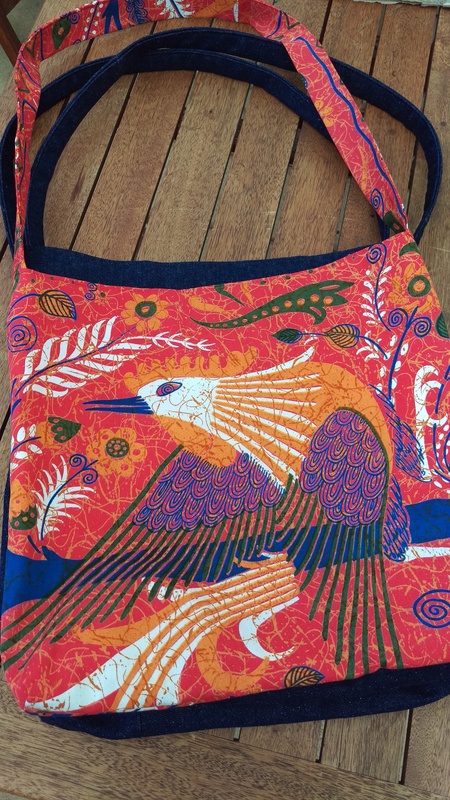 This time I committed to making bags for a stall on World Environment Day and one of the sweethearts from the local group dropped 12 labels at my place. 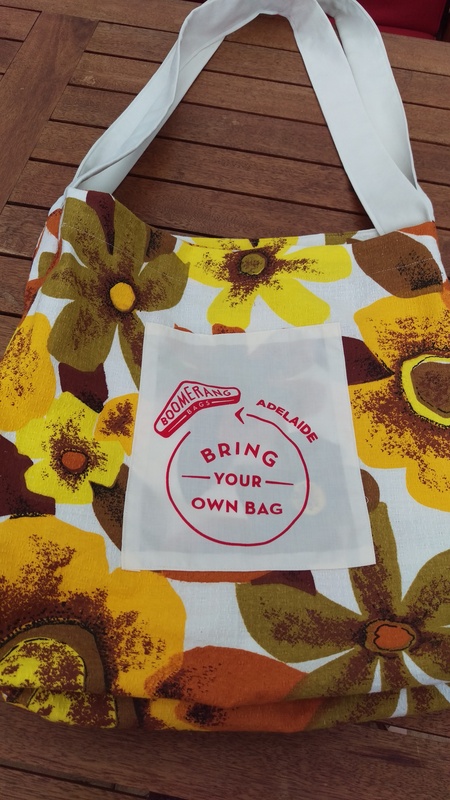 Some of the labels were apple green (hard to colour co-ordinate), and I’ve noticed that many of the bags the group creates are made in floral prints. 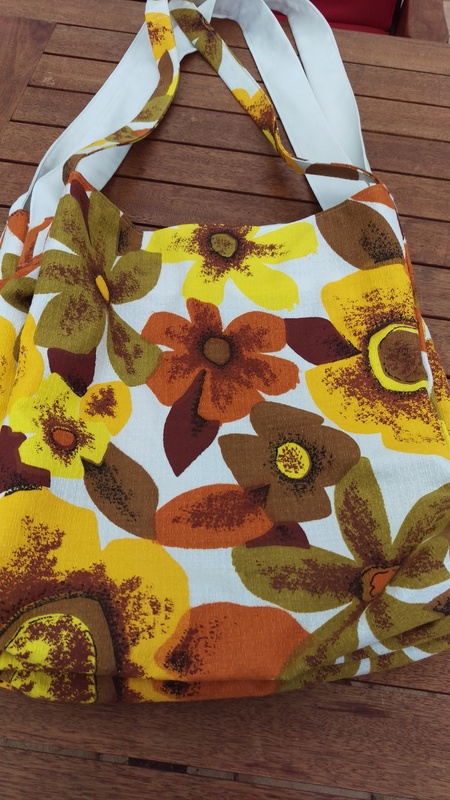 I’m going out on a limb assuming there are other folk like me who would prefer a not-so-floral bag. So–I checked to see what relatively plain fabrics I might have and decided the time had come for some unloved trousers made by me over ten years ago. I’ve worn them a lot over about a decade, even though I had to face the hash I made of the welt pockets every single time. Never again! Here they are cut into their constituent parts, and below–as bags. A pair of hemp pants that have never really fit, and are so badly made I’ve mended them several times in a life of few washes and wears. A couple more pairs of trousers that I won’t wear again. Two pairs of op shop jeans saved for a day I need denim, and a pair of op shop linen pants, ditto. Orange linen picked up at the tip shop outside Hobart for a song (because who wouldn’t take their mates to the tip shop if you were passing?) 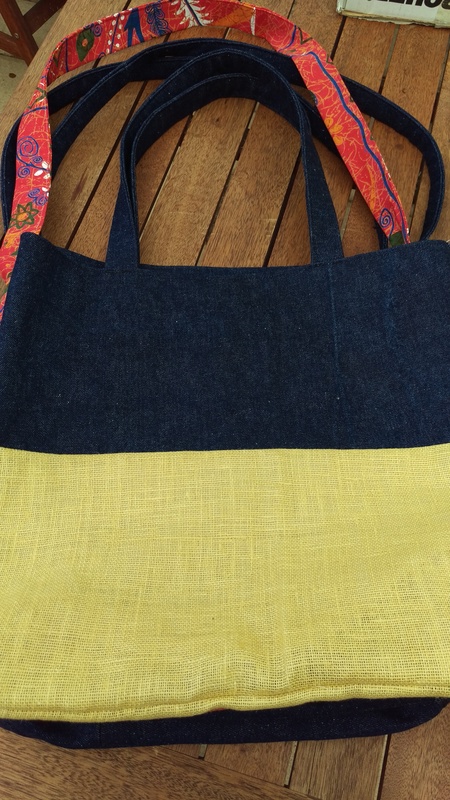 Some repurposed canvas cushion backing dyed with eucalypts. Oh, the pockets! It’s a shame to let a well constructed pocket go, so these are now features! Needless to say there was constructive piecing on the outside, and where the outsides were pieced together, there are linings (often pieced too). So now my thirteen bags have gone to Boomerang Bags, and I have more labels. I inherit fabric and have fabric dropped off at my place faster than I can re-home it. I still have unloved wardrobe items and clothing past use by date. I have clothing that is upwards of 20 years old, some parts reclaimable and op shop items salvaged for repurposing. So, I believe I can keep at this project for the foreseeable future without concern for supplies and with benefits for my cupboards. Did you really think I could stop at… oh… ten or twelve bags (especially as I was on holiday)? Naturally, I could not. I went to the Guild and there was a pile of denim offcuts. You know how it is. They all turned out to be different denims, each one reasonably narrow but the width of the bolt. No concern to me. I paired some with a yellow open weave linen (I think) I have inherited. I made several of these and they look quite elegant. This patch was found on the footpath in Melbourne in December. It seemed wrong to leave it there to the wind, rain, mud and passing shoes and dogs, until it found its way into the stormwater drain. 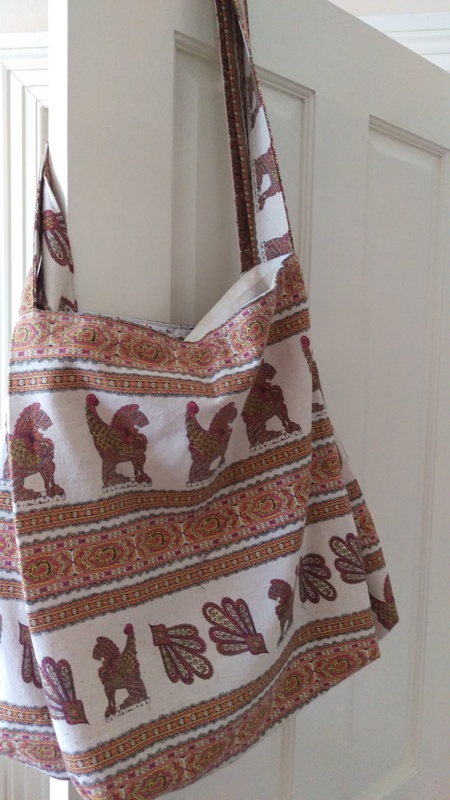 And this bag is made from a piece of fabric my mother-out-law passed on to me in the last year. 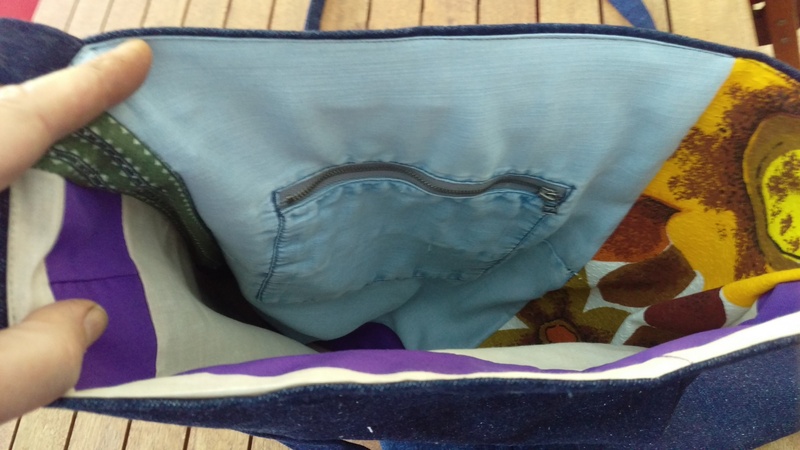 On the inside, all manner of scraps and bits and pieces, and of course–more pockets! One day at Guild, one of my friends gifted me two pairs of worn out cargo pants, in case I’d like to find a way to reuse them. Some people really know you! They were made of tencel or some similar wood pulp based fibre. They had been much worn, like a favourite garment. And they had so many pockets! Ones with zips, some that were more of a welt pocket… some that were stitched shut and had never been ripped open for use–lots to play with. 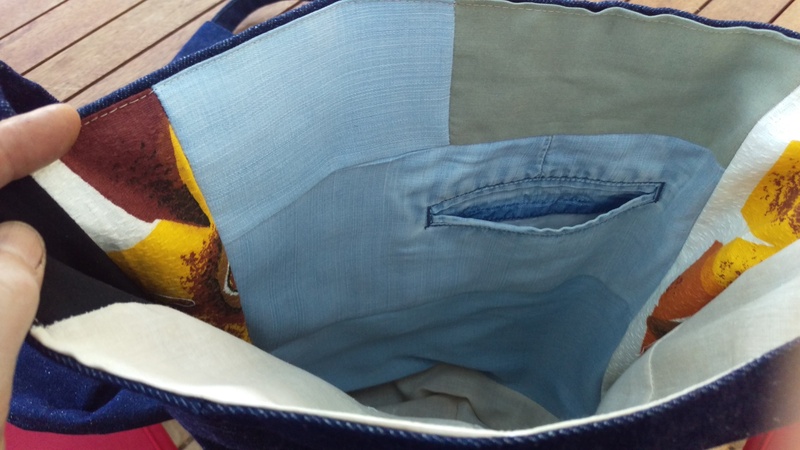 So I cut them up, extracted the cotton drawstring cords for later use, and began piecing the intact fabric into bag linings and likewise, the pockets. There was an entire series of bark cloth curtain fabric bags. 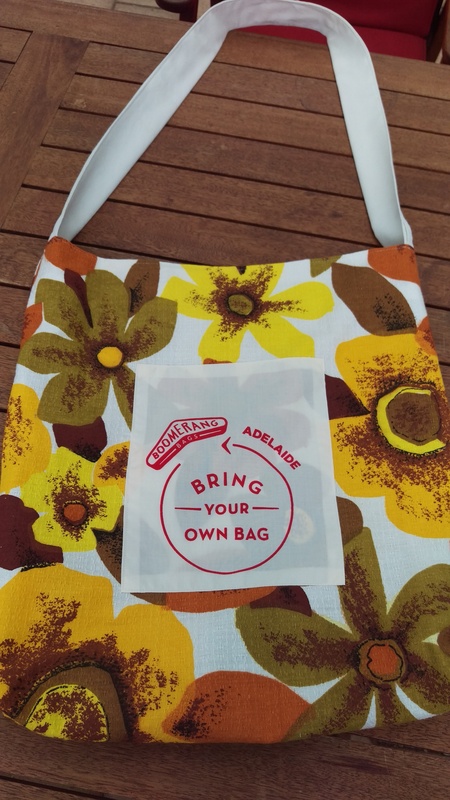 I used up the boomerang bags patches I was given by one of the Adelaide organisers a while back pretty quickly. Then I did a series with the remaining secondhand IKEA fabric my daughter gave me a while back (the orange and white stripes). They match my ironing board cover and they are extra large. 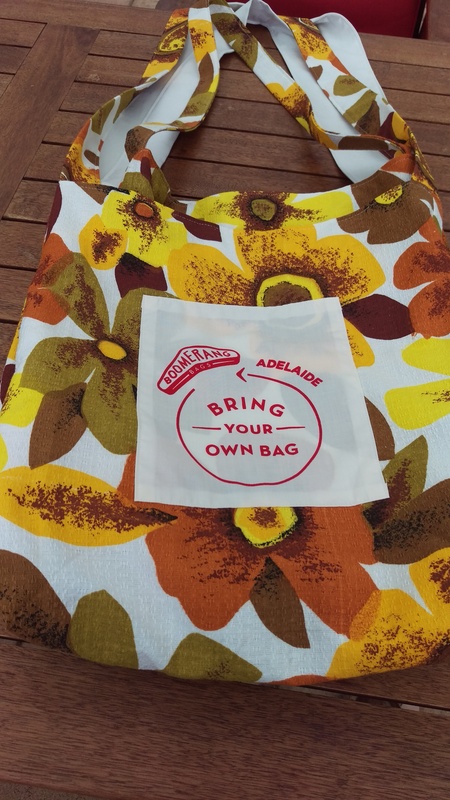 Finally, I converted some fabric I remember buying at Paddy’s market in Melbourne at least 20 years ago (cough, maybe it was 30 years ago) into about 4 more bags. I must have been reliving my childhood as an admirer of ancient Egypt when I bought this, I think. I vaguely remember feeling obliged to buy something even though I couldn’t spare the cash at that time (it must have been the nature of the interaction with the stallholder). The print gestures in that direction, but I really can’t see it as a garment. Some of these bags have already gone to friends, and others await their ultimate destination.